2 years ago (or was it 3?) when Craftyguider was still starting up, I made a duffel bag for eldest Craftyguidelet’s PE kit at school. One of the mums at school saw it and asked if I could make one for her daughter. 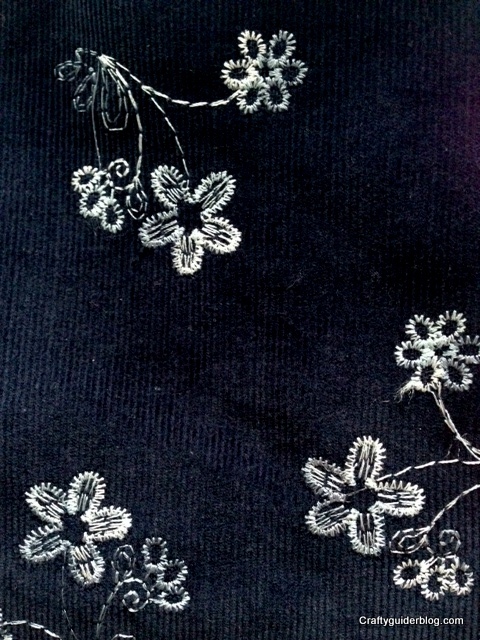 She wanted something in a dark fabric that would be quite hard wearing, so off I popped to the local habby and found this. I love this navy corduroy with the embroidered flowers on it. I bought some for the bag and got a bit extra to make a dress for youngest Craftyguidelet. 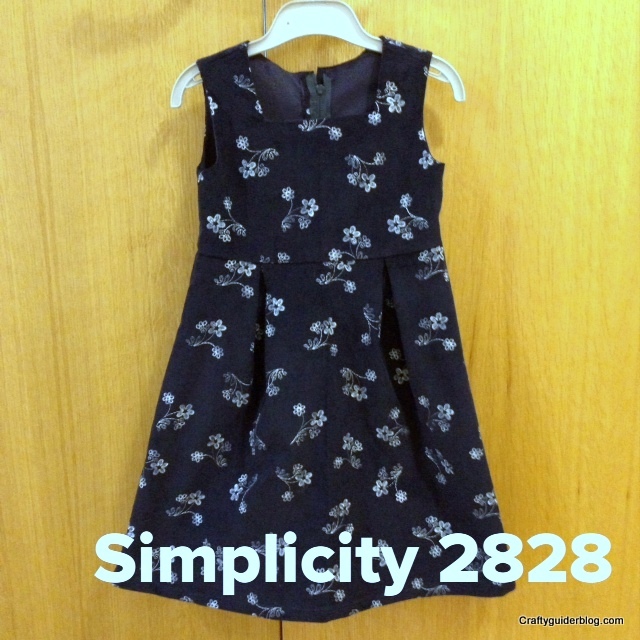 I was taken by Simplicity 2828. 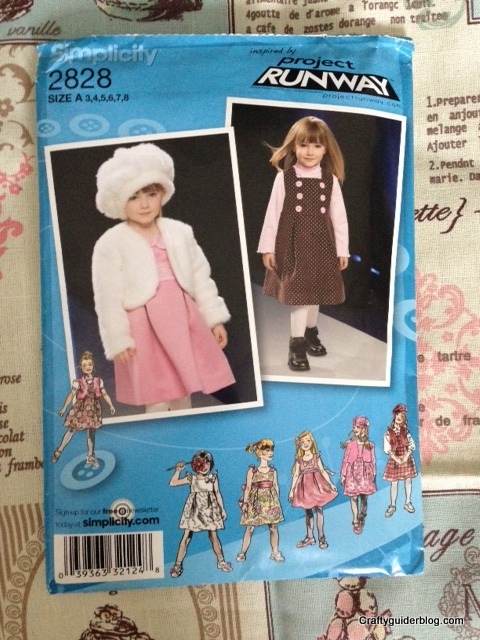 I don’t think I’ll be making the fluffy hat somehow, but the pinafore was spot on. 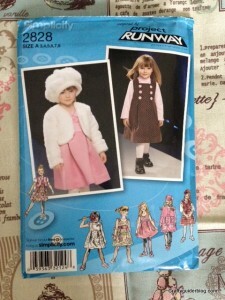 The Project Runway patterns enable you to pick different design elements to personalise your own creation. I didn’t want any of the ruffles or bows so I just did the basic square neckline dress. Earlier this year I got on and cut out all the pieces for an age 5 girl so that youngest Craftyguidelet could grow into it. She is now 5 and a half and tall for her age so perhaps she won’t have that long in it. My fault for stalling all this time! Note to self: don’t trace patterns or cut fabric until you are ready to make the whole dress! Et voila! I love how it has turned out, and luckily little Craftyguidelet loves it too. It even goes over her plaster cast at the moment which is a big plus. She was so pleased with it that she brought me a mini curlywurly from the chocolate drawer. What? You don’t have a chocolate drawer in your house? You are missing out! So about 3 years after I planned to start the dress, it is now finished. 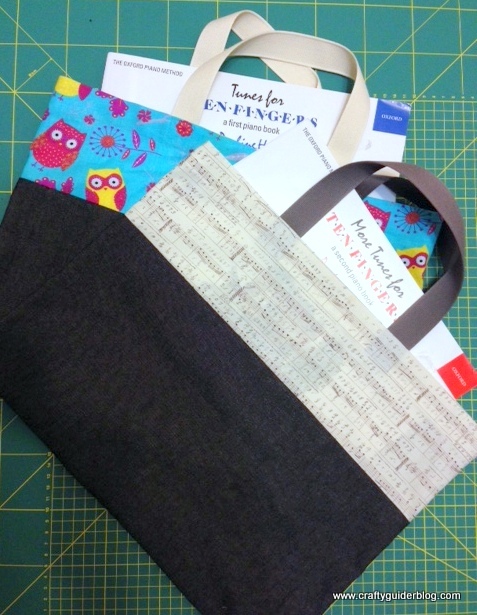 Have you got any long term WIPs in your basket? The Craftyguidelets are very lucky to go to a school where they can have piano lessons during the school day. Eldest started last year, and youngest has her first lesson today. During the summer holidays, eldest Craftyguidelet reminded me that I had promised to make her a bag to put her piano books in last year. This prompted youngest Craftyguidelet to ask for one too. As we were standing in the fabric department in John Lewis, I was cornered. 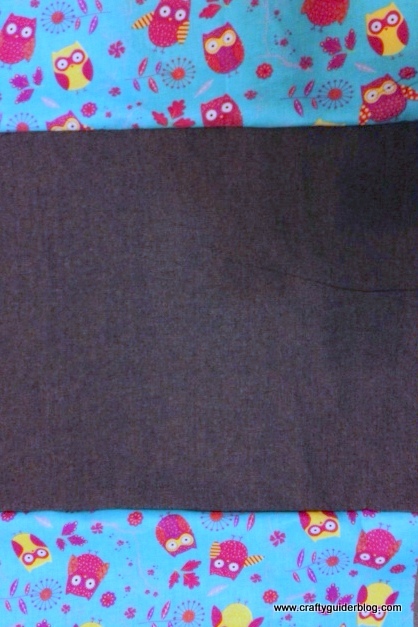 I am naturally weak when it comes to resisting the purchase of fabric anyway, so I bought some lightweight black denim for the main body of the book bags. 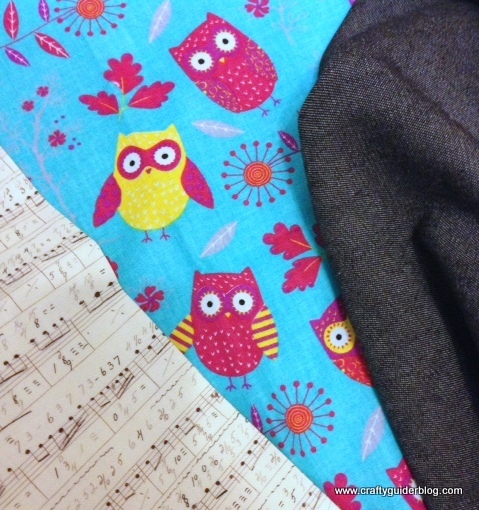 Eldest Craftyguidelet chose the nice Tim Holtz music fabric, and youngest Craftyguidelet chose the owls. I was going to make book bags with a velcro fastening flap like their normal school book bags, but instead we compromised on a simple tote bag style (these bags were made the night before their lessons so I was going for the easy option!). 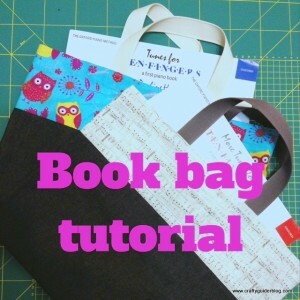 My finished bag measures 41cm long x 30cm tall (excluding handles) so check the dimension of your books and adjust accordingly before putting scissors to fabric. 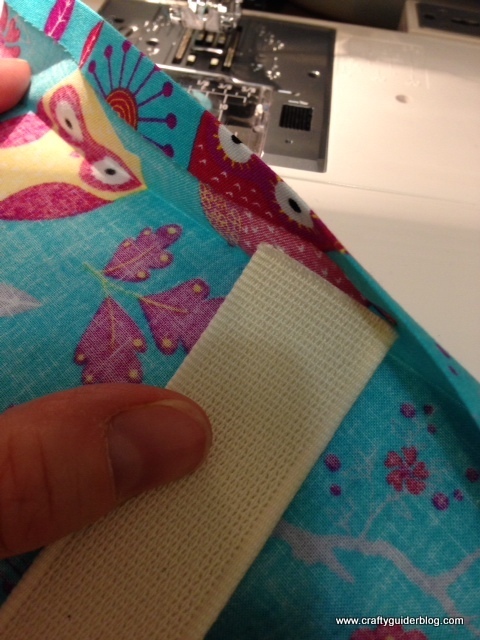 I’ve used a 1cm seam allowance unless stated otherwise. 1. 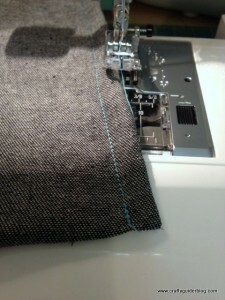 With right sides together, attach one piece of the accent fabric to each end of the main fabric, matching the 46cm sides. If your fabric design has a top and bottom, ensure the bottom of the pattern is next to your seam line or your owls will be standing on their heads! 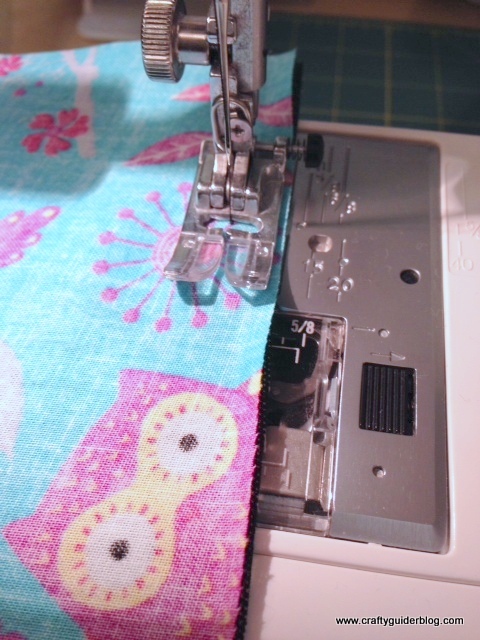 Neaten edges and press the seams flat. 2. Prepare the hem for the top and bottom edges by ironing a small fold and then a larger fold to make an enclosed hem. I used 1cm and then 3cm. 3. Position the handle 14cm from each edge under the fold you have just ironed. 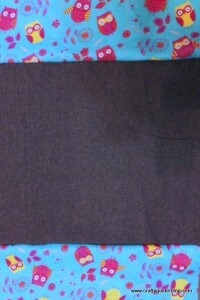 Fold the hem back over the handle and stitch the hem closed close to the edge. 4. 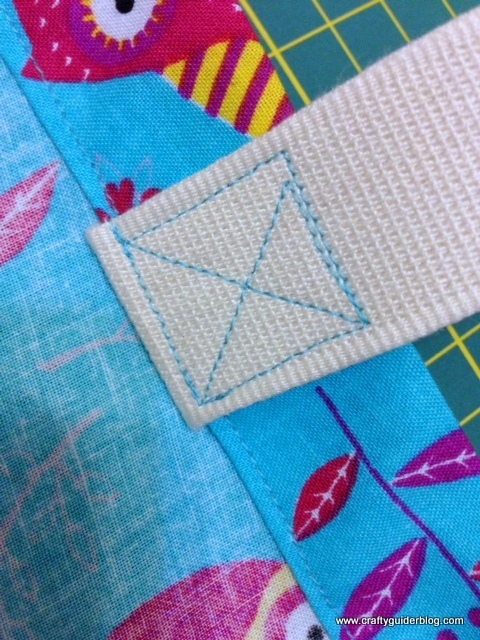 Fold the handles up and sew in a cross pattern to secure. Repeat for the other handle. OCD and perfectionist crafters look away now. It was late at night when I did this so my cross isn’t sewn to my usual high standards! 5. 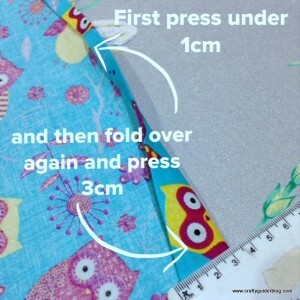 Fold the fabric wrong sides together (yes, wrong sides! 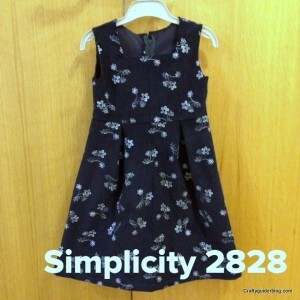 ), matching the hems. Stitch the side seams. Trim the seam allowances slightly. 6. 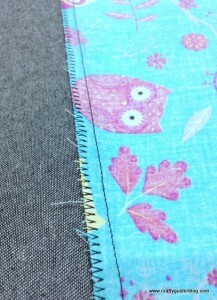 Turn inside out and stitch again to make a French seam, making sure you enclose the raw edges fully. 7. Turn right side out and press. 8. Marvel at the lovely bag you have just made in hardly any time at all! 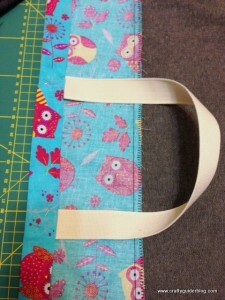 You can use my tutorial to make bags for your own personal use only. Please do not reproduce the tutorial in any way without permission. Oh August. Our relationship started so well. You gave me time to start blogging again, I started creating, I got things done. 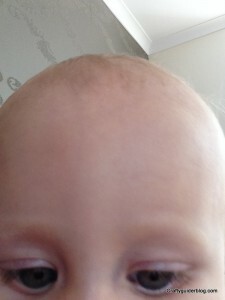 My nephew came to stay and then later on there was the celebration of his Christening. 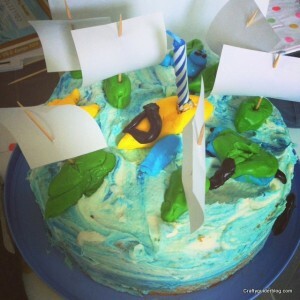 Husband’s birthday came and went, and the Craftyguidelets’ vision of a sailing themed birthday cake was realised. The Craftyguidelets and I found 38 Books About Town book benches in 3 different areas of London, did some sightseeing, fell in love with the impressionists in the National Gallery, and completed the summer reading challenge at the library. 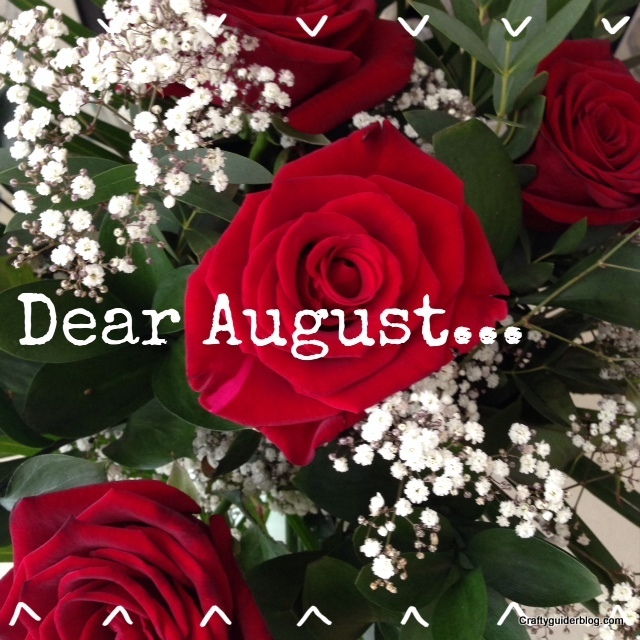 Oh August, you kept us busy. But towards the end it went wrong. 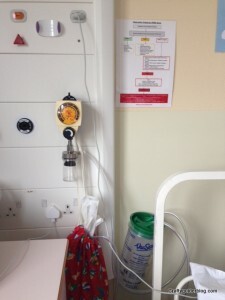 A trying extended-family holiday culminated in little Craftyguidelet breaking her arm and spending 2 nights in hospital. How could you let that happen August? My little girl looked so tiny on that big bed as they wheeled her away for surgery under general anaesthetic. You brought me flowers – hydrangeas to remind me of our lovely holiday in Cornwall and roses from husband for our wedding anniversary. But it’s too late August. The pain of the hospital stay and seeing my poor little girl’s deformed arm, and now the huge cast that she has to carry around is too much. It’s over August. I’ve decided to give September a go. The Craftyguidelets will be back at school and my volunteering with Guiding, the WI and school starts up again. I’ll need to be busy preparing Craftyguider for Christmas, as well as starting my own preparations. 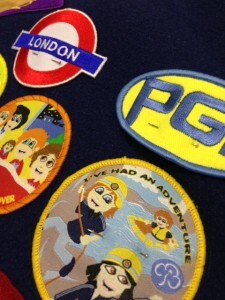 I’m also joining the Trefoil Guild and hoping to start my Voyage Award. So long, and perhaps I’ll see you around some time in the future. Aside from my back going twang and the rest of the family going down with the lurgy, January was a very positive month for me. I got lots done, I started decluttering, I’ve been crafting, I’ve gained new skills and things are going well. I need to carry on this positivity and keep the momentum going. I still have more sorting out to do, particularly my email, and there are always crafty WIPs to finish. I want to set myself another couple of goals for February. 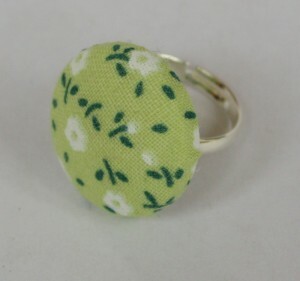 Firstly I want to get my Etsy shop relaunched. I set it up in February last year, listed one item and then abandoned it. Obviously it’s more advantageous for me to attract business through my Craftyguider site as I don’t have to pay fees to list there, but I hope that Etsy will help me reach more people. Hopefully by the end of the month I’ll have a selection of products listed. Secondly I want to get fitter and start losing weight again. I’m supposed to be following a Slimming World plan but my weight fluctuates up and down because I’m not strict enough. I want to shed the last bit of weight I need to shift, and also get a bit more exercise, in particular, starting pilates to strengthen my back so it won’t go twang again! 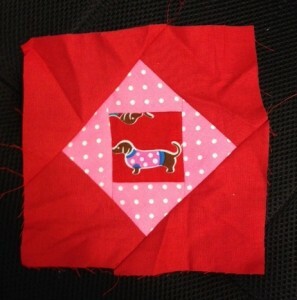 And finally, I am going to finish my mending, and sewing badges onto the Craftyguidelets’ badge blankets. I might even get a couple onto mine, but I am 7 years behind so I don’t anticipate on completing this one! What do you hope to achieve in February? And just like that, it’s the 31st January! One month of 2014 has passed and the next 11 months are stretched out ahead, full of promise. On the whole it’s been a good January for me. I’ve felt a lot better (apart from putting my back out in the last few days), I’ve made decisions on what I want to do with the business and my blogging, and I’m in a positive frame of mind. January started really well for me. 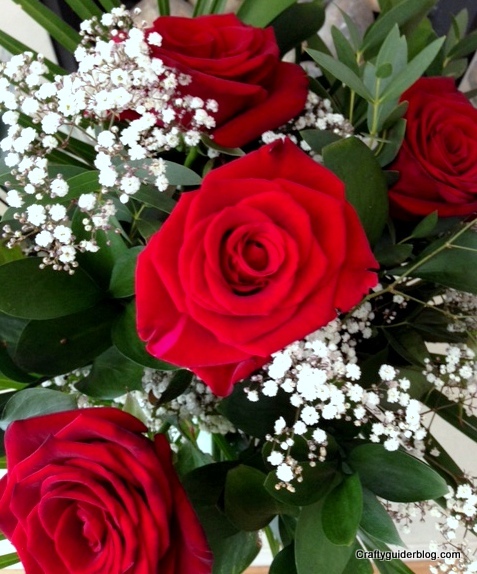 A couple of days after my birthday, I won a retweet from Theo Paphitis, and my twitter feed exploded with new followers and good wishes. I managed to get my craft on and make cards, get some scrapbook layouts made, finish some decoupage and get some sewing done. It’s the most creative I’ve been for a long time. 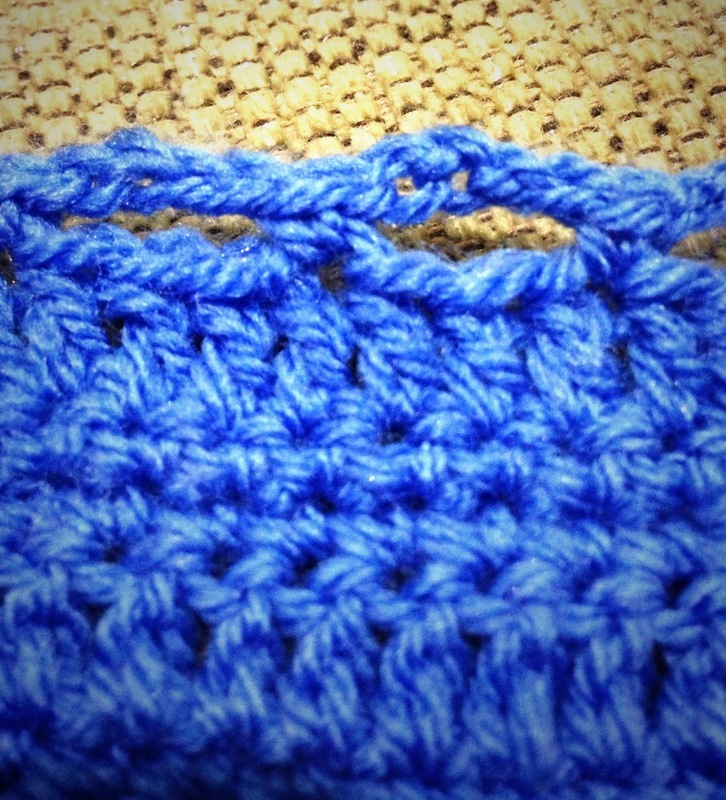 I’ve also started crochet lessons which is something I’ve wanted to do for a couple of years now. My doubles and trebles lesson was a bit more successful than my tea gloves lesson. Perhaps it’s because I don’t drink tea, I just don’t have the tea gloves gene in me. 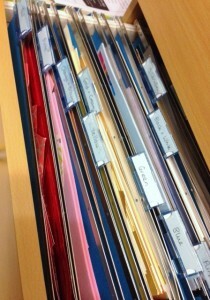 Probably my greatest achievement is to get more organised. My magazine mountain is now a foothill, and several WIPs have been completed. I’ve got a long way to go still, but with each mini breakthrough, I feel more weight coming off my shoulders. I’ve had a very productive few days. 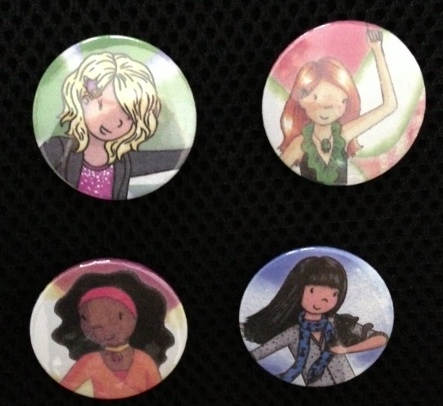 I have organised, crafted, planned Brownie badges with eldest Craftyguidelet (Craft badge is first!) and decluttered. However this morning I managed to throw my back out. I was emptying the waste paper basket of all things! As we are having some work done on the house, I couldn’t go back to bed so I have been stuck at the kitchen table with my ibuprofen and heat pad. I did manage to get my decoupage papers and mod podge out and I’ve managed to complete my “bake” sign for my kitchen. I used the Hobbycraft Deco Mache papers which are really pretty, and chose the colours to go with my handmade place mats which use Cath Kidston spotty fabric. 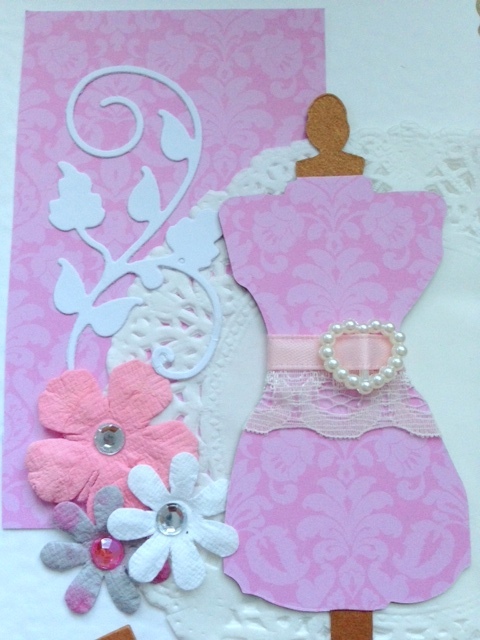 What I really needed to do today was photograph and list my new handmade cards. On Sunday I had a play with some Anna Griffin papers. 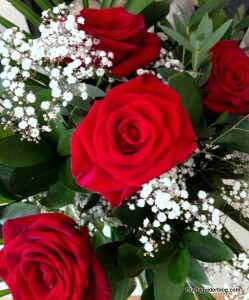 Look at the wonderful vintage images of flowers I was working with. 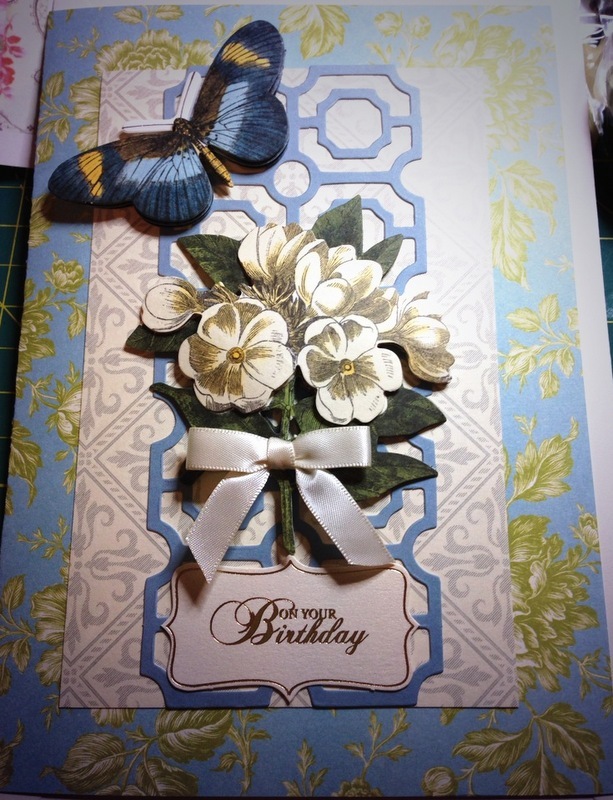 I’ve got a huge pile of cards to list for all sorts of occasions so keep an eye on the website. This is one of my favourites. 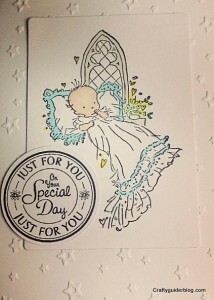 I love the blue tones on this birthday card. I also used some of my craft themed supplies. 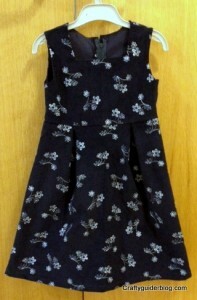 This one uses a Sizzix die for the mannequin and some swirl dies that I bought a long time ago and have never used. I have also been doing my crochet homework. 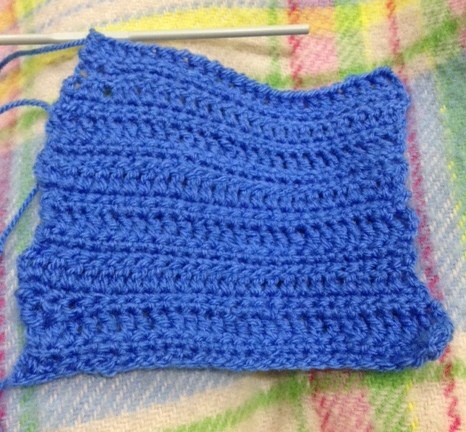 Regular readers would’ve read about my lesson with Jean-Mary at Betty Makes where she managed to tame my disobedient crochet hands into yarn holding, treble making, crochet wannabees. Still a bit wobbly, but look! It’s crochet! I haven’t counted my stitches or rows, but I think the technique is coming. 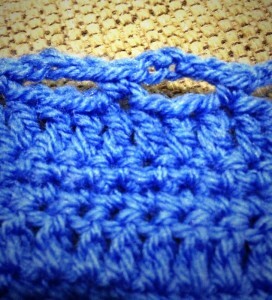 I’ve even tried the edging. It’s loops! The pattern became a bit of a foreign language after this so it’s not got much further. Jean-Mary says I need to treble in my loops. Hmmm. Might get a translation and a few pointers tonight if my back will let me go to my lesson. I’ve also managed to keep up my decluttering in January. I’m still on track with my challenge to recycle a magazine a day. The pile is going down. I won’t have finished a WIP a week though unless I get a sudden surge of creativity in the next few days, but I am getting more organised. My loose crafting papers were in a box that was too heavy to get down from the shelf every time I made a card. I managed to clear a space in a filing cabinet by turfing out some obsolete Guiding paperwork, and put the papers into files by colour. I might actually use them now! I’ve also sorted through my 12″x12″ scrapbooking papers and managed to do 3 scrapbook layouts. No pics as I generally use photos of the Craftyguidelets in my scrapbooking, but it’s been really nice to have a look through images of them as babies (yes, I’m that far behind!). It’s been a really productive January, so hopefully my back will clear up quickly and I can carry on. I’ve got plans for February too to keep 2014 as a positive year for change. 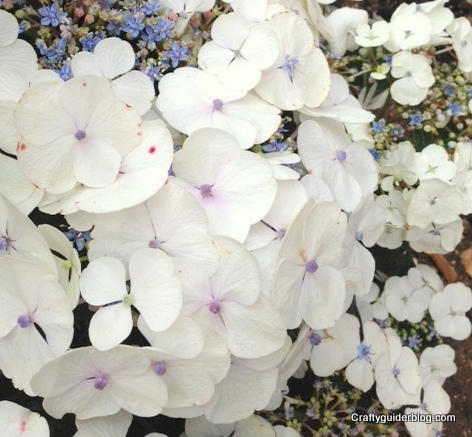 Linking with Handmade Harbour’s Handmade Monday. 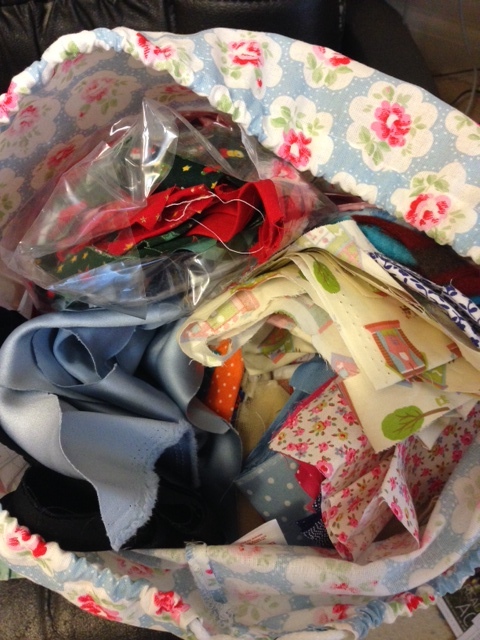 I have a lot of fabric. I have confessed before to my addiction; I see something, I like it, and I’ll buy a metre or two because “I’ll make something from it” and then never do. This is a photo of my scraps bag which are defined as smaller than a fat quarter but bigger than a 5cm square. I use a lot to make mirrors, tissue holders, and rings amongst other things, but it’s still full to bursting. 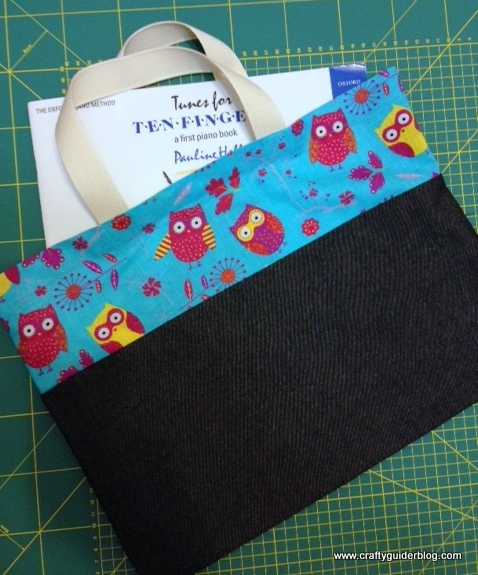 I read on Instagram about the #economyblockalong on @sewjustinesew’s feed and spotted an opportunity for a fabric stashbuster, a step up for my current patchwork skills, and a community feel to my crafting should I need support. 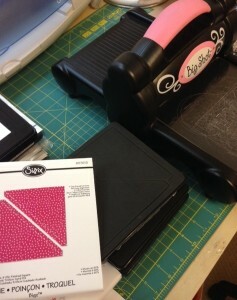 There is an excellent tutorial on Red Pepper Quilt‘s blog, but I thought I would drag out my Sizzix quilting die’s that I bought some time ago to help me cut the pieces out. I found 3 dies that gave me a vague approximation of an economy block and made a trial square. Yes, I know it’s not ironed, and it still needs trimming, but it’s a trial, OK! In a true economy block, the corners of the centre square should touch the centres of the ‘diamond’ square, so I’m going to have to weigh up the convenience of using my dies to cut out rather than doing it the conventional way. Is anyone else doing the #economyblockalong? 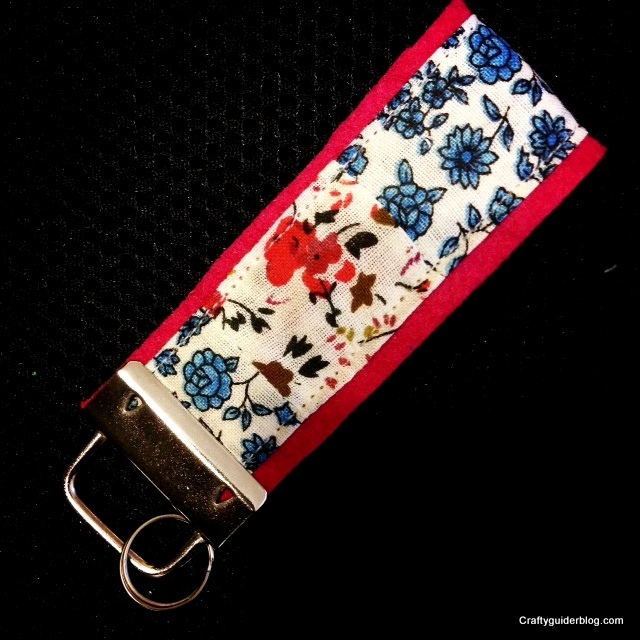 Linking to the Handmade Monday linky party. 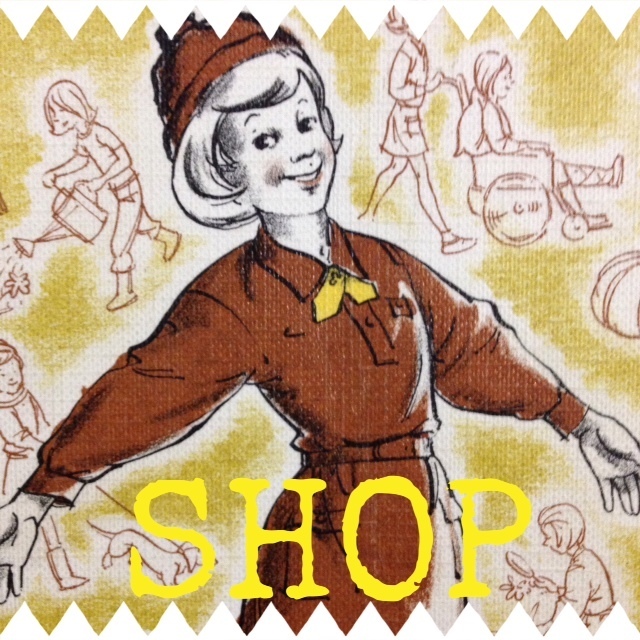 I wanted to get more focused on my blog and my webshop in 2014. I’m still on catch up, so my targets for January were just to get my workspace organised. Simple but achievable. However, I did start a couple of things. I have a plan in place for what themes I am concentrating on for www.craftyguider.com month by month. 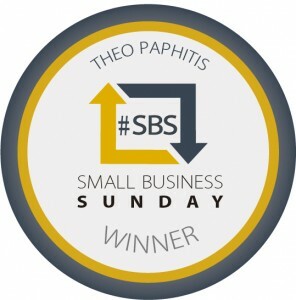 I have started following more accounts on instagram, pinterest and twitter, as well as more blogs on bloglovin, and I started entering Theo Paphitis’ Small Business Sunday competition on twitter. Two weeks in, I won! I am so pleased Theo Paphitis personally chose me, and having had a quick look through the #SBS winners website, the benefits are fabulous, I’ve increased my exposure on twitter, and I hope this, with a bit of hard work, translates to more sales in my webshop. And best of all, I hope to meet Theo and get a certificate at his next winners event. I’d love to hear from you if you have any creatives you think I should be following on social media. And obviously feel free to click on the links above to follow me! 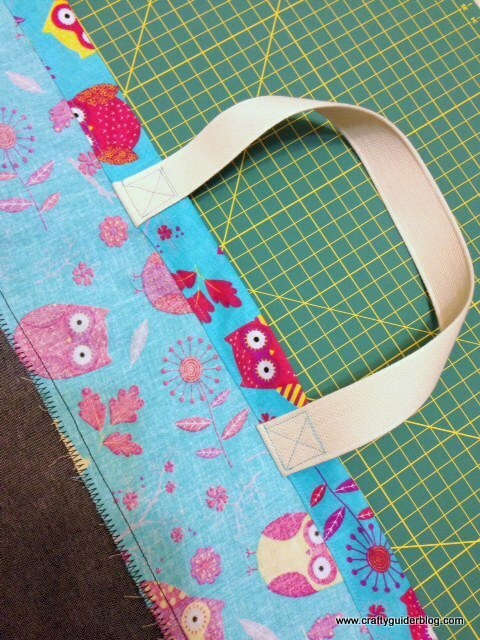 I’ve been lucky to have been able to get a move on with quite a few crafty projects to tick off my WIP list. Last month’s #WIPslinky post was a bit up and down with success in clearing my archive, so I set myself a realistic task list for this month. 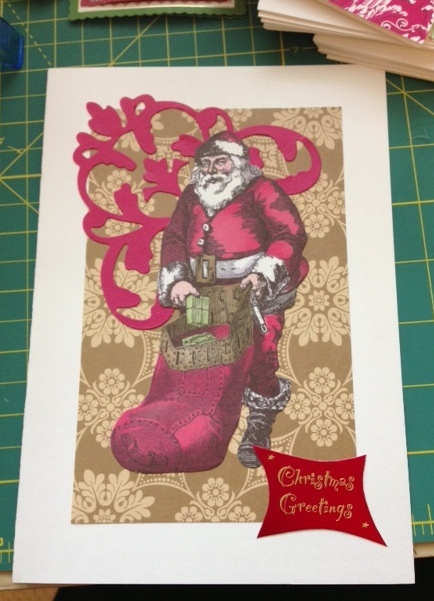 I have started my Christmas cards. I am about halfway through making them and really enjoying thinking up different designs. I am also enjoying using up the different elements that I have collected over previous years. 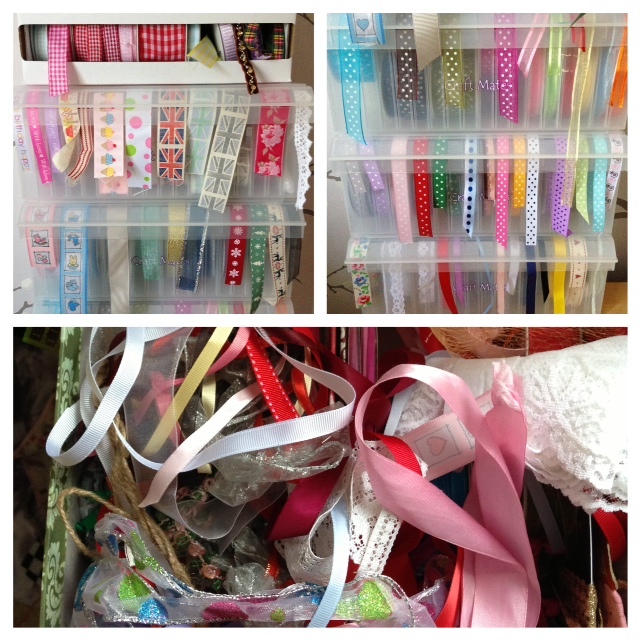 Perhaps I will be able to store all my Christmas crafty bits in just one box this year! I have also managed to get lots of fabulous new products made and listed on Craftyguider. These frame purses were featured in a previous post and are now on the website. 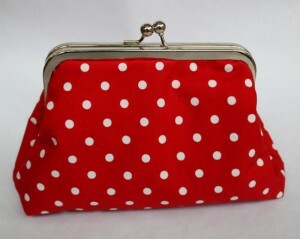 This polka dot one is my favourite. 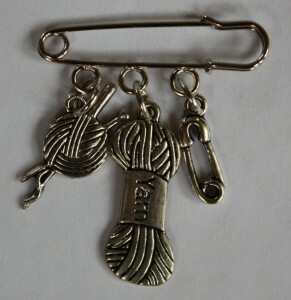 I’ve made five kilt pin charm brooches with themes of sewing, gardening, owls, party girl and this knitting one. 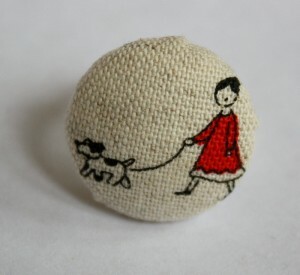 And I’ve been sewing Christmas decorations too. 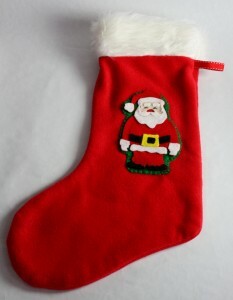 These stockings are made of soft fleece with a furry cuff. I’ve made several different versions including these ones. 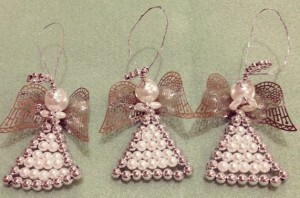 I’ve also been making Christmas tree decorations for the website this year. 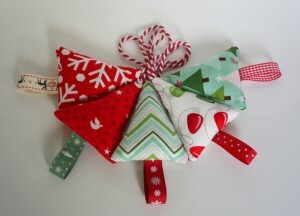 The pine cones are made with pins and folded fabric, and the cute Christmas trees use some funky Christmas fabric. 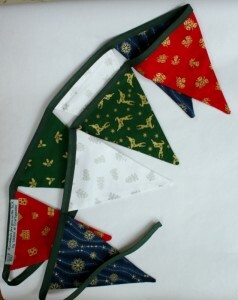 One of my biggest sellers last year was Christmas fabric bunting so I’ve got four colour combinations listed including this one. Quite a successful month! Just as well as I have a craft fair to go to on 17th November in Puckeridge, and there are bills to be paid at Guides (where all the profit goes). Next month I think I’ll focus on getting the Craftyguidelets’ WIP list started. They use the dining room as their craft room and I need to reclaim it in time for Christmas. They need to make Christmas cards for friends and teachers, there is a half finished hama bead ballerina that needs completing and ironing before it gets knocked on the floor (again! ), and there are numerous projects and kits that they have started and never finished. 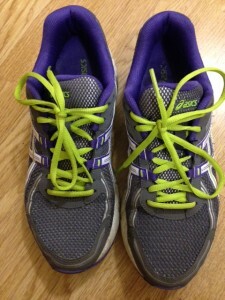 What do you need to get finished before Christmas? Linking to Tales From Mount Pleasant’s #WIPsLinky party. Come and join us! 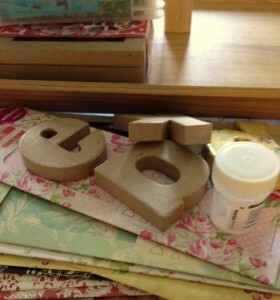 I have a lot of craft stuff as I have many different crafting interests. I am an expert at packing it away, but this causes problems as I never know what I have, or it is so difficult to get at I never use it. 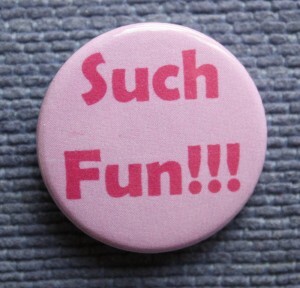 This week I have a had a sort out and tidy up as in 2 months, 18 days, 6 hours and 19 minutes (at time of writing! 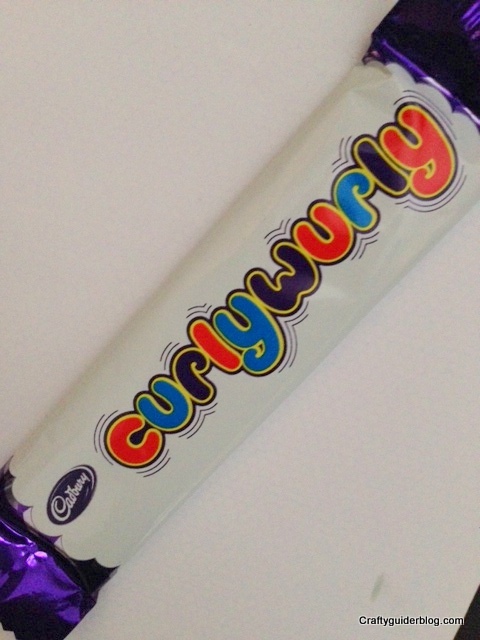 ), a certain bearded, rotund, elderly gentleman will be doing his rounds. My ribbons are more organised, although I still have 2 disorganised boxes of scraps, lace, ric rac and “miscellaneous”. 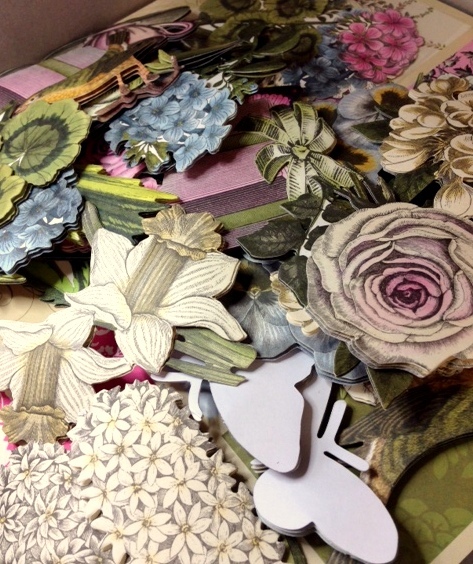 I have also sorted my embellishments for card making so it is easier to select a box of flowers or some crystals to use on projects. I’ve had a few family and friend cards to make including supervising these 3 for my dad. 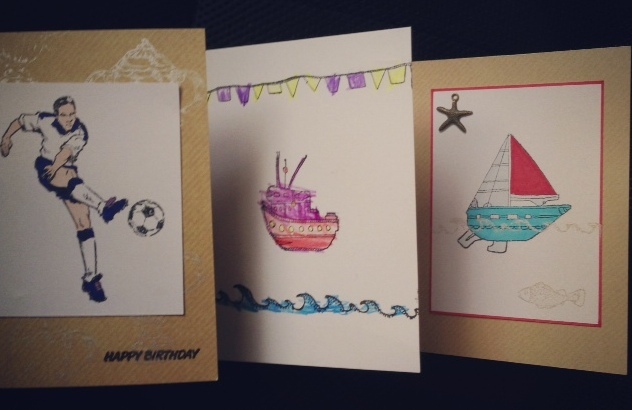 From left to right, created by eldest Craftyguidelet, youngest Craftyguidelet and me. Having access to all my stamps again meant a stamping frenzy. 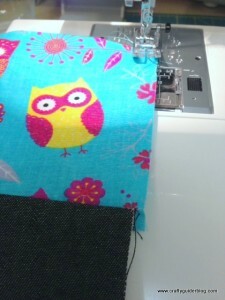 The sewing machine has also had an airing. 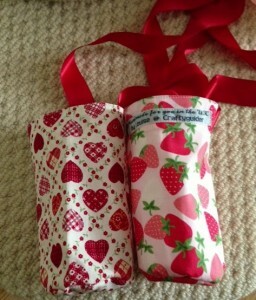 I’ve been meaning to make these holsters for the Craftyguidelets’ water bottles for some time. When they travel to and from school they have all sorts of luggage including book bags, PE kits, music folders and cardigans, and it’s come up as a problem at the school parent forum. Perhaps I can sell these at my next craft fair. Having posted a picture of my Rainbow unit’s latest batch of ‘patrol’ badges, a Rainbow leader on twitter requested some for her unit too. She loves them and hopefully the Rainbows will too. And now, those with delicate sensibilities should look away. I am about to use the C word. Christmas card production has started. I have made 23 cards and glued together 14 decoupaged toppers. Fortunately I have lots of pre-prepped bits and pieces so at the moment it is full steam ahead. Needless to say it will slow down when I start on the stamping and colouring. I have also started a bit of Christmas crafting. 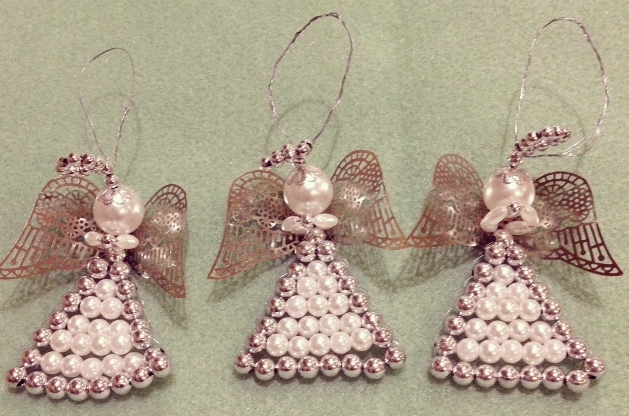 These angels came in a kit I bought and didn’t get round to making last year. The instructions were poor but I managed to adjust them to make three decorations for my Christmas tree this year. 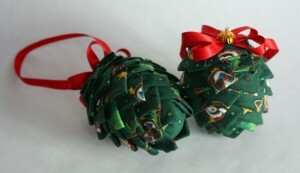 I also tried to finish making the leftover fabric pine cones that the Guides had last year for their Christmas craft. The aim is to put them up for sale to put the funds back into the unit, like everything in my Craftyguider shop, however I ran out of pins so it’s back to the shop I go for more. I am really enjoying this flurry of crafting. In a tough week health-wise, it’s kept me going and I’m ticking off the WIPs. Have you started your Christmas crafting yet? Linking with Handmade Harbour’s Handmade Monday linky party.